The Lake Waranga Caravan Park & Holiday Camp is situated on the banks of the Waranga Basin, this provides our guests with ideal location to engage in activities such as swimming, fishing, boating, water skiing, jet skiing and other water sports. The Waranga Basin is a Goulburn Murray Water off stream storage that supplies irrigation water to the north and west of the State. It is a typical warm water fishery with a twist. The Basin has a capacity of 411,000ml and has a surface area of 58 square kilometres when it is at full capacity. It is one of the largest storages in the Goulburn system. It is fed by two massive channels, the Cattanagh and the Stuart Murray. You can still launch a boat when the level reaches 23% although a 4 wheel drive is advisable. Access to the Basin is via two concrete public boat ramps off Harrimans Point Road (these are not accessable all year but the one off the Rushworth/Tatura Road (Waranga Basin Road) is. The only camping permitted around the Basin is at the Caravan Park. There are no dogs permitted around the Basin. There is good fishing in the Basin, mainly Redfin but also Yellowbelly and Trout. The public boat ramp is adjoined to the caravan park. There are 4 towns within close (25km) proximity offering a wide variety of shops, restaurants, pubs, activities and site-seeing adventures. The closest of which is the historic gold-mining town of Rushworth. Rushworth is also surrounded by the largest remaining Ironbark forest in the world. 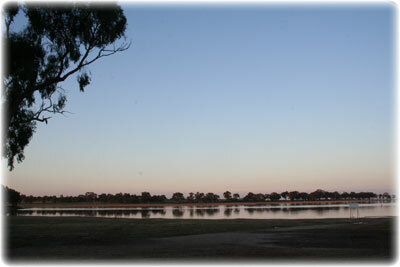 Welcome to the new Lake Waranga Caravan Park Web site.